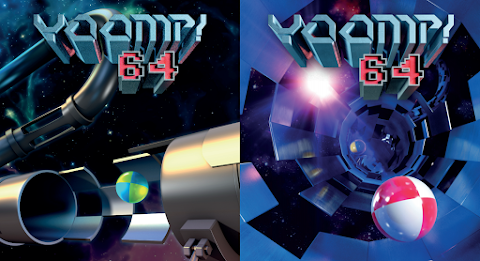 Way back at the end of 2007 - back when RGCD was still a disc-based magazine - I reviewed an Atari XE/XL game called Yoomp!, a game that I was asked NOT to describe as “Trailblazer in a tube” (which in fact, it pretty much is). Truthfully though, Yoomp! is in fact a 3D reinterpretation of a Atari 8-bit game called 'Jump' by D. Johannsen, originally released back in 1986 - which is coincidentally the same year as the aforementioned Trailblazer. Anyway, to cut a long story short, we championed the game back in 2007, awarding it 5/5. You can read the full review here. As to be expected, discussions of porting the game to other platforms popped up across various forums and irc groups, but at the time Yoomp! was generally considered to be a game that would be impossible (or at least incredibly difficult) to convert over to the Commodore 64. Fast forward to 2016, and Zbigniew ‘Zbych’ Ross (joined by MCH) took it upon themselves to achieve the near-impossible task of creating Yoomp! 64 - a game that RGCD together with Psytronik will be releasing in the next few weeks on cartridge, disk and as a ‘pay-what-you-want’ download. Zbigniew’s port (as briefly mentioned in the previous issue of Vandalism News) shows off what a capable beast the humble Commodore 64 really is, with 23 levels of increasing difficulty, smooth rhythm-synchronized gameplay and some bassbin-rocking new SID tracks from MCH. As with the original Atari 8-bit version (and indeed ‘Jump’ before it), in the opening stages you are gently introduced to the different tile and bonus types - including jumps, holes, teleports, tunnel stop and start, increase and decrease brightness, lightning and screen-shake - and of course the occasional extra life and long jump pick-ups. Passwords are earned as you progress, and you’ll need them too - the game gets pretty brutal near the end! The main hold up on our end was of course the family issues I had last year, but the end is finally in sight - all the material on my end has been ordered and I’ll be putting together the itch.io page later this week, with the packaging going to the photographers soon after. One aspect out of my control was a delay in the cover art - a situation that interestingly resulted in the game receiving two finished cover designs/illustrations that arrived within the same week earlier this year! With both Ilija’s and Tommes’ submissions being of excellent quality (as seen above), in the end we decided to use them both (with Ilija’s homage to the original artwork as a poster, and Tommes as the cover).